Planting broccoli, like all other vegetable growing, does require a little aforethought. The first is what variety you are going to plant; some do better in the cooler weather, others in the summer. Talk to your nurseryman. This page was last updated by Bernard Preston on 25th March, 2019. Then there's another important question; do you want the heading type, or the variety that branches? Both have their virtues, and actually I grow both. The heading variety means that you reap the crop once, and then pull the plant out, ready for the next vegetable; they won't branch. The branching variety goes on bearing for months, so it takes up more garden space, but you have a long period of broccoli for your pleasure and well-being. 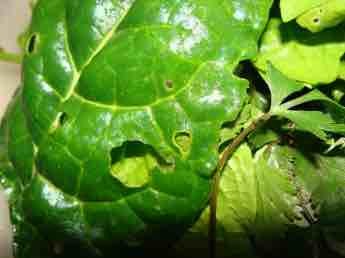 Another disadvantage, if you find walking to the garden to reap your supper an irritation, is that plucking the smaller florets from the branching type may take you five minutes, but the heading kind takes only thirty seconds to harvest, albeit once off. The first picking of branching broccoli will be fairly large like this, but still much smaller than the heading type. Then for months you'll go on getting these smaller florets. So before planting broccoli, make a decision. If you have a larger garden, I recommend both. There's no doubt that planting broccoli and other vegetables for your table requires a different mind set. It means a conscious change from 'damn, I have to go and pick broccoli', to 'ah, ten minutes of bliss in the garden,' away from the hustle and bustle of whatever. Leave the cellphone behind. Pulling frozen broccoli from the freezer, washed and neatly sized may be a lot easier. 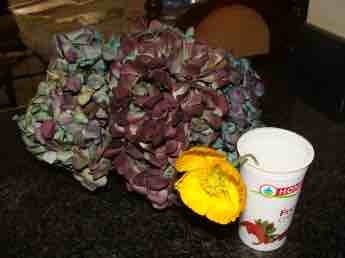 But it won't taste half as nice, will certainly not be nearly as nutritious, and is probably loaded with pesticides. 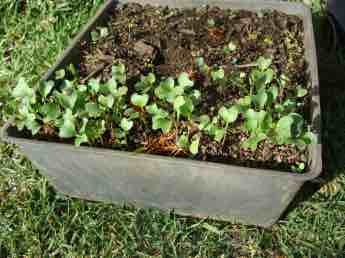 Plus, if you're a greenie, you can plant your broccoli in compost instead of using organic fertilizers. Or, a bit of both. 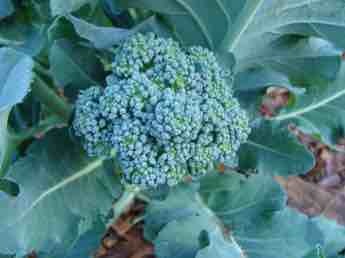 Glucoraphanin is the active ingredient, or one of many probably; just one of the many benefits of planting broccoli. Another is lutein; a deficiency is the prime cause of age onset blindness. Lutein macular degeneration is a subject for all of us to understand. One of the other advantages of the branching type is that researchers have found that the smaller florets are even richer in glucoraphanin, the anti cancer photochemical found mainly in broccoli. Read more about it at our broccoli facts page; use the Site Search function in the navigation bar to find your way around. Planting broccoli is really easy. The seed germinates very quickly; these were planted two weeks ago, the boss tells me. Behind in the box are parsley and spring onion that are more laggardly. As a general rule, I prefer to plant directly into the ground. Transplanting seedlings I find laborious and it sets them back by at least a week or two. You need to shade them and generally fuss over your little plants. Planting them directly in the ground gets you around the fag of all this. However, because broccoli plants grow about 18" apart, it means a long tenuous line, with a tiny seed perhaps every foot, and you may need to thin them. She who must obeyed prefers planting them in a seed box; that way too you can keep them in a warm sunny place in early spring, and bring them indoors, or cover them at night. It's August now in the southern hemisphere and we could still have another frost. Then it's a case of digging a trench that you fill with compost; it's probably physically the most difficult part of organic gardening, excellent exercise but doing back and shoulder stretches before starting is vital. Otherwise you'll be keeping your chiropractor in business. You can forgo the trench and perhaps just fork in a small spade of compost for each plant. It depends on how busy you've been building a compost pile, and how much time and energy you have for the garden. Actually, I'm looking now at a new system; a portable chicken tractor. The chooks will turn any green material we feed them into manure, obviating the need to dig these trenches; it really is heavy work and probably quite unnecessary. This is one of many but our choice chicken tractor design; I made mine from electrical conduit so it's easy to move; the farmyard sounds add a new peaceful dimension to life. Full sun for planting your broccoli plants, please; this year, with crop rotation, it's in the sweet potato patch. 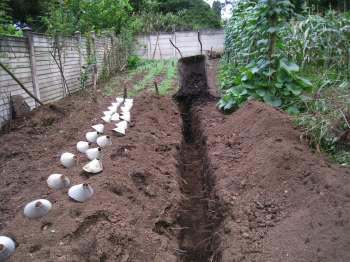 Dig trenches if you have plenty of compost, and a strong back, or just a spadeful in each hole. Last year, 2018, in this patch I planted broad beans to put fertiliser back into the soil; it's the richest plant protein too, and prevention of Parkinson's disease to boot. I lament with Jamie Oliver that farmers plant them for nitrogen but the British no longer enjoy them and they mostly get ploughed in. Read more about this precious legume at how to plant broad beans; they are also known as favas; rotational planting is important. In 2019 we followed them with peppers so that are so rewarding and the richest source of beta-carotene. Preventing a beta carotene deficiency is vital for our health; there's plenty in your greens like broccoli too. Eggs Florentine takes less than ten minutes from start to finish; a little longer if you are picking the spinach and a couple of the florets from planting broccoli. You may well think I'm a crank, a bit of a fruitcake. It's probably true, but in my defense, we have had so much cancer in the family, so much agony, expense and premature death, that I make the time to do these fruity things. I'd rather spend the time on prevention by planting broccoli, and besides, the taste is amazing, than waste it in the years to come on chemotherapy. First drop a lump of butter in a pot, and then an onion and, if you like it hot, a jalapeno. I do. 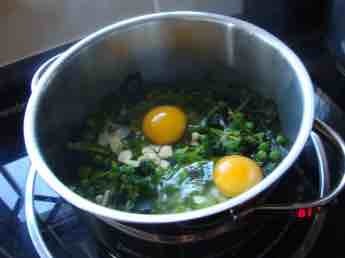 Eggs Florentine is based on a bed of spinach. Wash thoroughly and you can see the bugs also know what's good for them, not just Popeye and me. An aside; when you buy food at the green grocer, and it's absolutely perfect, you know it's been sprayed with toxic poisons. I've deliberately chosen a holy leaf; the housewife's taster has been, and declared it wholesome. You can see a slip of cilantro too. And now for the fruity part of Bernie Preston, lover of life, and hater of cancer. 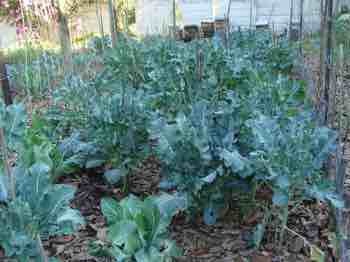 Toss you chopped spinach on the onions, add the broccoli florets and anything else interesting in the garden. In this case, it's fresh green peas. Plop on your two eggs, cut two slices of sourdough bread recipe for the toaster, smother with butter and you have the perfect eternal life food. I'd rather aim at 100 and fall short by ten or twenty years, than neglect my body and die in misery in my fifties or sixties. Oh, there's garlic in there too, you can see. Broccoli and eggs are loaded with folate, vitamin B12, zinc and magnesium, the vital elements to immediately metabolise toxic homocysteine in your body; it's a breakdown product of protein metabolism and responsible for many very serious illnesses. Read more at homocysteine cardiovascular. And of course all that glucoraphanin to keep the big C at bay. We've recently launched the new chicken tractor that can be dragged around the garden. Research shows that free range eggs have three times as much omega-3; that's the stuff that reduces inflammation in your body.There's no cigar for guessing which of the above comes from our free range cage free eggs. Kaempferol is a carotenoid that is found in many greens including broccoli now proven to enhance our well being and help prevent illness. You are probably saying you don't possibly have the time for this crazy stuff. Well, I did double up with some quality bonding time with my six year old granddaughter. We spied a bee-eater that can devastate my colonies, a red-eyed bulbul snacking on cape gooseberries and she was delighted to find the first poppy of the season. It may come as a surprise but new research shows the there is a broccoli osteoarthritis connection; drug companies are licking their lips in anticipation of synthesizing and persuading you to pay exorbitant amounts of money for glucoraphanin; we would rather get busy with planting broccoli. Ten minutes to pick the broccoli, jalapeno, spinach and green peas; and watch the apple of my eye pick that poppy for granny. 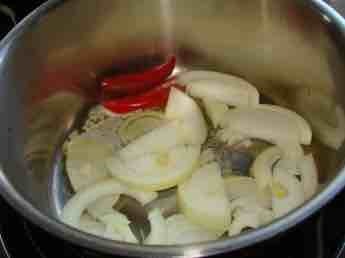 Two minutes to slice the onion and drop it into the pot with a smidgen of butter; yes, butter is back. Research shows that it's the trans fats that do the damage, and simple carbs that add the pounds, not the healthy fat. 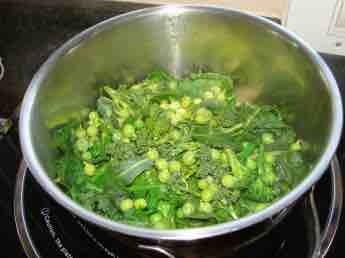 Perhaps five minutes to wash the greens and pod the peas. Two minutes to steam, add the eggs and slice the bread for the toaster. About twenty minutes of sheer pleasure; on a Saturday morning, with no chiropractic patients I have a bit of extra time. You can spy the beehives in the background. 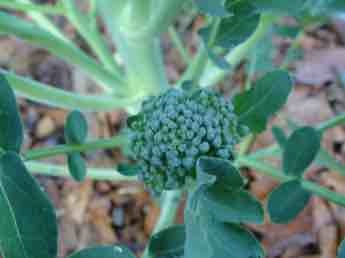 They just love the yellow flowers that will be appearing when the branching broccoli gets ahead of us. 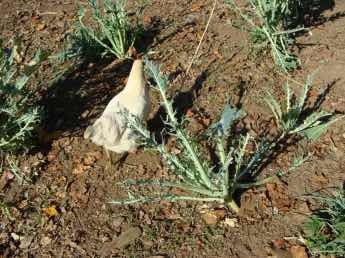 Incidentally, don't let your hens into the broccoli patch. They'll strip the leaves in no time if there's a shortage of greens; instinctively they know where health is to found. Best chicken feed must include a source of greens; that's where they get the omega-3 that makes free range eggs so valuable. Healthy choice foods are not an option is we want to live long, pain free lives; planting broccoli is just one consideration if you love your veggies fresh. The highly inflammatory diets of so many today are the reason why we have so many aches; add to that trauma and subluxations and you'll have a nightmare that your chiropractor can't easily fix; nor can the surgeon. Start this week by adding just one fresh green every day to your diet; something like spinach, lettuce (not iceberg) or broccoli. Your organic green foods make a wonderful start to a new healthier lifestyle. Then move away from seed oils to cold pressed extra virgin olive oil; wonderful stuff. Healthy choice foods may cost a little more, but once you factor in the dollars associated with sickness from a junk diet, then they're dirt cheap. I'm convinced that it's eating these healthy choice foods are the reason I consult doctors less than once a year, and then usually for a speck of brick dust in the eye after angle grinding! Thank goodness my house is now built and I can spend time doing the fun things instead of chasing walls. Mind you, I'm about to install new solar panels on a west facing roof; it's a little experiment to produce more power in the late afternoon. Healthy choice foods will save you a mint, and planting broccoli is queen of the anti cancer brigade.